Already having a Sound System hard to beat.Yamaha NS200ma & Infinity RS325 speakers. HK 3270 Receiver and a back-up Technics SA Gx330. Sony NC675P CD/DVD unit. My problem is that I live in a wealthy area, (But I'm a broke dog). I am surrounded by Goodwill's, Habitat for Humanity's an Salvation Army's. They are inundated with high end stereos. I've got great gear stacked to the ceiling in my spare bedroom thanks to these fine charity establishments. I recently picked up a pair of perfect Polk R30's for $50. I hooked them up to a 100 watt Denon AVR681 I found at Habitat Humanity for $30. Low end was definitely absent. I picked up an Infinity TSS-450 Sub for $22 at the Salvation Army which cured a simple problem. Anyone who dislikes their 2 way Polk Audios for lack of full sound will turnabout 180 degrees by using a quality Sub. Picked these up used. Initially I was impressed it seemed as though it had great build quality, small footprint and its MDF seemed more dense than other comparable models. Hooked them up as mains to a Denon 7.1 Channel Receiver. Eventually I had to move these to the rear, it just couldnt stand as Mains. Not audible at low volumes, At higher volumes, it seemed to distort, and even some of my Bookshelf Speakers (Klipsch SB-1 and Polk Audio Monitor 40) outperformed these towers. They sound good, but they just dont have the clarity and effortlessness that it takes to be the anchors of a living room home theater. 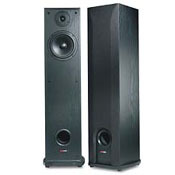 The R30's are better suited in a stereo configuration in a Garage or Lounge room as a secondary setup. Highs are very shrill. Voices sound distant. These are great speakers for people looking for a LOUD home theater setup. Any looking to enjoy music with these should look elsewhere. Sound-sounds like tinpan-JBL bookshelves sounds a lot better. Got a good price on these at one of the frequent sales at outpost.com. Built quality is very high. These are beautifully speakers. I have the cheery finish which is very beautiful to look at. I was not expecting much bass but this is ridiculous.These speakers just simply sound crappy. Too bad because I really like the look. I'm running them with a Denon 1804 receiver in my bedroom and I'm not impressed. Despite what other reviewers have said, you cannot get any decent sound out of these speakers without a Sub. I'm using them with a 12 inch JBL sub in a stereo configuration. The highs are harsh and sound more like a tinpan than a tweeter which is very tiresome to my ears. I was really hoping to like these speakers because of the price and looks. No point in sending them back since i paid se little and shipping cost was over $30.00. I would have taken them back if I had bought from brick & mortar. I'm not bitter though..just one of those things. I give them to my little sister..she cant tell the diffrence and they are "pretty" as she says. Does what there suppose to do wonderfully. Doesnt sound like $1000 speakers but close. Infinity,JBL,Boston Acoustics also very good, Bose. Good clean sound, warm, smooth. I think you need to be a polk fan to really enjoy them. They really need to be backed up with a sub for them to really work. Not too large, or it will over power the speakers. I use them for stereo playback, but they wouldn't be my choice for a HT. They would be great for a budget HT, but they don't JAM. They are more of a natural smooth sounding speaker. The R30s are the best speakers in the world in this price range. They are better then speakers that cost a lot more as well. They are a AMAZING find. Polk Jr bookshelf speakers. The R30s sound cleaner then my first set of polks. Awesome rich sound in highs and mids, more bass than you would expect from a 2 way this size. haven't found any yet, and probably won't for the price paid. You absolutely cannot beat this speaker for 80 bucks a pair (on sale that is). these speakers produce excellent highs and mids. Bass is even good with no sub. I mean, come on, don't complain about the bass, they're 61/2 woffer/mid combo. I'm pretty sure that its assumed you will be using a sub with these. i use mine without the sub occasionally depending on what i'm listening to, i.e. classical.I do need to adjust treble on my unit, again, depending on what I have playing. I purchased these only due to the sale price (I didn't really need any new speakers) and the quality Polk is known for and I have been nothing but pleases thusfar, these technically probably aren't even broken in yet. The only downside I have found so far, and this isn' entirely the fault of the speakers, is that I tried to run them as a rear channel out of my Denon AVR 1801 and they didn't sound so hot, probably because they were dropped to a 6 or so ohm load, which the Denon can do but doesn't like so well. I have since switched them to the B channel of my Nikko Alpha 220 and they sound fantastic. Overall, I'm very pleased with these speakers, excellent buy. Highs and mids unclear, and lack of bass. Well, I installed a pair of r-30 and really i didn't like me because is a floorstanding speaker that sounds like a little bookshelf. highs aren't detailed, te sound is dirty, mids arn't clear and lack a lot of bass, bass don't exist. The quality of the construction is fine, but the sound si very poor. If you want to use it, you have to use a subwoofer.